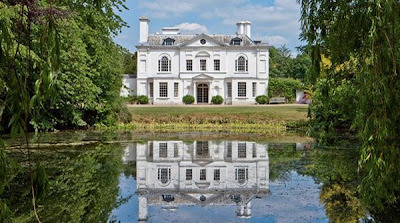 Still touring senior citizen rock star Rod Stewart and his long-time lady-wife Penny Lancaster have reportedly shelled out around £4,650,000* for Durrington House, a hulking, Grade II listed Palladian-style pile about 30 miles north-east of London on 46 bucolic acres near Epping Forest on the Essex/Hertfordshire border. According to information Your Mama dug up on the internets, the country estate includes a substantial main house with four reception rooms, a paneled formal dining room plus a separate morning room, a billiard room, 10 principal bedrooms, five bathrooms, three fireplaces with carved wood mantels, and a wine cellar in the basement. The oldest part of the house dates back to the early 18th century with later additions from the 19th century. The property's numerous outbuildings four cottages, a stable block and a carriage house with an 18th-century clock tower. 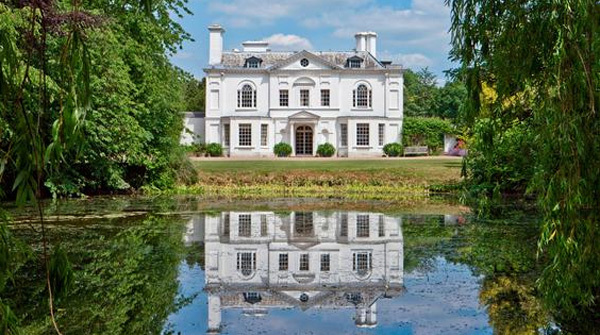 The estate's grounds include vast lawns, formal and informal gardens, a rose garden, an orchard, a greenhouse and potting sheds, a croquet lawn, tennis court and alfresco dining terraces. Mister Stewart's property portfolio includes another country estate just about 30 minutes from Durrington House plus a nearly 13,000 square foot house in Palm Beach (FL) and an almost 19,000 square foot behemoth in the famously steroidal Beverly Park community in Beverly Hills (CA). *As far as we can tell, £4,650,000 is the last known asking price for the property. A few quick clicks and clacks on Your Mama's handy-dandy currency conversion contraption shows that amount equals $7,239,820 at today's rates. It's not known—or at least it's not yet been revealed—what amount Mister Steward and Miz Lancaster have agreed to pay for the property. I like what I see in that photo. Though my favourite house once owned by Rod Stewart would be the Kern estate on Carolwood. I wonder if Brad would ever sell that one and how much would it fetch, considering that it is now on an expanded lot. Selling it is mostly irreversible.The Sotheby's sale was actually pretty spectacular. Lots included iconic items such as jewelry, both genuine and costume. It actually looks like his Beverly Park Landry pile if I recall from AD. Beautiful as Durrington House is, much of interior has been cannibalized into a quasi-modern nightmare. Historical integrity -- gone. Found a few inside pics online. Lost the link. 7:40, about to post on Beverly Hills in AD, too. Still will, but re L-word’s BH involvement., confident Stewart spec’ed out plan and lead results rather than going on blind faith like some do. I adore Stewart's BH home in AD. Person preference I suppose. Interior esthetics are as important as the bones. Pulled my AD issue last night to love it all over again. The colors, subtle layering of textures, textiles, antiques, artwork, sculpture, millwork, et al. blow me away. Online too. If Durrington’s restorations/rescue happen with BH influence, interiors will be a knock out. That is, unless Rod goes totally Austin Powers here. This place defines real estate wood. I hope he has the good sense to spend some time there. Zillow zestimates Rod's ex-house on Carolwood at around $10m and the adjacent parcel at $20.5m, probably because it still thinks there is a house there. So that makes it $30m and there is one other parcel right next to Brenner's, but I have no idea to whom does it belong.